Electric Generator Uses Spin of the Earth to Produce Cheap, Renewable Energy; Invention Could Dramatically Transform Societies. 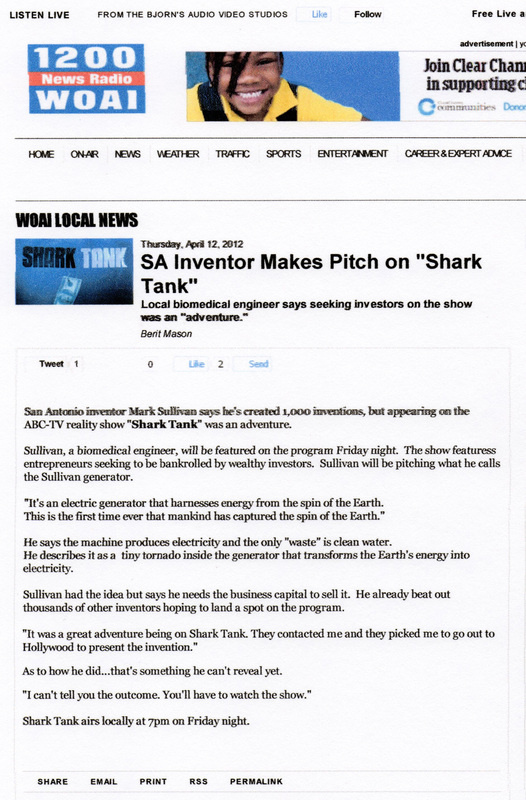 Meet inventor Mark Sullivan of San Antonio , Texas. In the near future, this humble yet brilliant genius may be recognized as Leonardo da Vinci’s 21st century protege if his mind-boggling new energy invention can secure the necessary funding to be built. On April 13th, that investment dream just might come true. This April, Mark will be introduced to a panel of five wealthy business people(“Sharks”) as a guest on “Shark Tank”, ABC’s hit reality TV series. 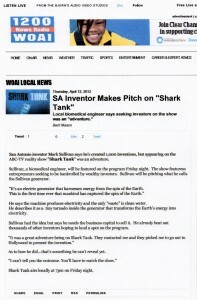 He was chosen from over 24,000 applicants to pitch his patented electric generator that harness energy from the spin of the Earth. The episode featuring Mark airs this Friday, April 13, 2012 at 8 p.m. (7 p.m. Central) on ABC.